In the beginning, the world was not as it is today. There was no sun to provide warmth or light. There was no earth from which fruit, vegetables, or flowers could grow. There was no water to quench the thirst of the living. There was no wind to transport seeds or provide a refreshing breeze. The Creator, Nyame, had become bored with the barren world. In an instant, and with just a thought, Nyame brought forth the sun, earth, water, and wind. Sunshine illuminated lush vegetation growing from the brilliant earth. The sounds of water flowing and breezes blowing produced a beautiful melody. It was good. But Nyame wanted to create more. “I’ll make children to help me take care of this world,” Nyame said. In an instant, and with just a thought, Nyame brought forth four magical beings called magbees: Sunne, Earthe, Watre, and Winde. “You are all my children, made in my image. Love one another and treasure each others’ gifts. Goodbye and I love you all.” Nyame’s voice faded as Nyame went off to create other universes. The four magbees were very responsible. Sunne did a wave dance every morning and evening to make the sun rise and set. By moving its hips in a circular motion every afternoon, Earthe put nutrients into the soil. When the soil became dry, Watre moved its fingers vigorously to summon the rain. Winde blew out gaseous gusts of air that carried seeds to new places. In their spare time, the magbees climbed trees and played hide-and-seek. They also sang. One day the four magbees travelled to a river. They looked down at their reflections. For the first time it occurred to them that Sunne looked different. Earthe, Winde, and Watre all had hair that lay flat and grew downward. But Sunne’s hair stood tall. Sunne’s heart sank. Tears formed in Sunne’s eyes. 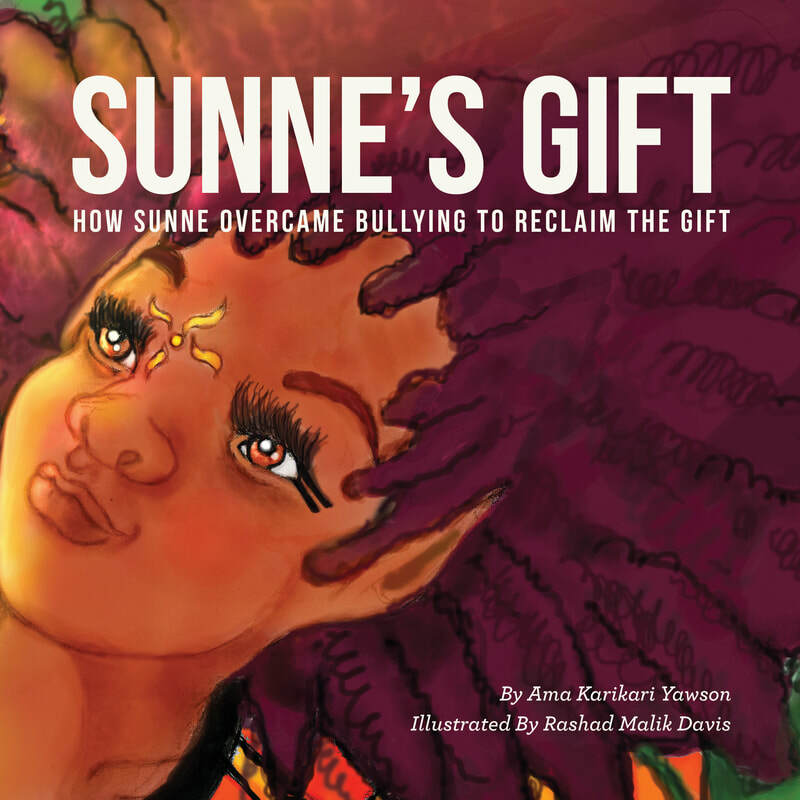 Sunne did not want to be different, ugly, ridiculous, or weird. “You must! You must! It’s worth the fuss! When the last spiral became straight, all of Sunne’s hair fell out. The sun disappeared and darkness descended upon the land. Sunne, Earthe, Winde, and Watre looked around in horror. DO YOU WANT TO READ THE REST OF THE BOOK AND EXPLORE THE CURRICULUM? Contact ama@milestales.com or call 347-886-2026 for bulk orders of over 20 books and purchase orders.